We unblock drains for commercial and domestic customers throughout Kent including Margate, Ramsgate, Thanet, Folkestone, Dover, Deal, Broadstairs, Canterbury, Ashford, Whitstable, Herne Bay, Faversham, Sittingbourne, Maidstone, Chatham and Gillingham, Birchington, Manston, Westgate, Cliftonville, Sandwich, Ash, Hythe, Sheerness. We provide free, no-obligation, quotations for all drainage services including blocked sinks, blocked showers, blocked baths, blocked toilets and blocked gullies/ gutters. 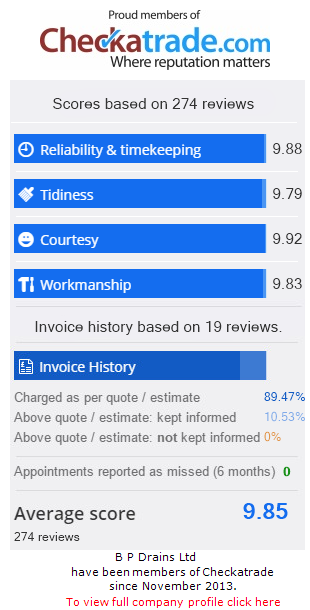 Our pricing structure is clear and we provide free, no obligation, quotations to ensure that there are no nasty surprises for our customers when we present our invoice once the work has been completed. We realize that it is not easy to find a drain unblocking company that will provide you with a high quality service at a fair price. Unfortunately, we are aware of numerous occasions where members of the public have been ripped off by unscrupulous operators who charge extortionate fees that are not necessary or justified. B P Drains has over 50 years combined experience in the drainage industry and since then we have provided expert and professional drain unblocking services for the domestic and commercial sector throughout Kent. This is the most basic clearance technique that we employ where the drain blockage is eliminated with the use of steel rods in order to restore the drain to free flowing conditions. Where a hose is introduced into the pipe, firing a powerful water jet at up to 4000 psi. A nozzle at the hose end converts the water into laser cutting jets which strip deposits from pipe walls, flush out waste and restore full flow. Electro-mechanical machining is used to thoroughly purge and de-scale waste pipes and main sewers. Flexible steel cables fitted with blades and cutters are used to quickly cut through debris, hardened deposits, tree roots and other obstructions to restore normal drainage function.